I recently came across a great use of personalized branding. It was genius in its simplicity! The #shareacoke campaign, all Coke did was personalize bottles and cans of Coke, Diet Coke, and Coke Zero with names, titles, and friendly sayings. They didn’t change the recipe, or give a huge discount, or hire an expensive celebrity to endorse it. This basic use of personalized branding has given coke a big spike in sales, social media buzz, and a major rise in public opinion of the brand. The campaign was originally trialed in Australia in 2011 and produced some impressive results. Young adult consumption increased significantly, up by 7%. The campaign also earned a total of 18,300,000-plus media impressions, and traffic on the Coke Facebook site increased by 870%, with page likes growing by 39%. Since the UK campaign was launched on 29 April, its proven to be just as big a hit in the UK. From a social perspective, Coca-Cola has seen its Facebook community grow by 3.5% and globally by 6.8%. The hashtag has also been used 29,000 times on Twitter (Brandwatch, 2013). I can testify to the effectiveness of this campaign, my career and education are both in marketing, and it wasn’t until I was at the register at my local grocery store with 2 more diet cokes than I needed, just because they had my wife and son’s names on them. That is when the brilliance of this campaign hit me. Coke has seen a huge increase in their social footprint and the overall impression of the Coke brand has grown. Consumers are posting pictures of the cans with their names on them, making funny photo’s and videos with #shareacoke. This type of publicity and advertising is what marketers dream of. The video of a couple announcing their pregnancy is a perfect example. How can this example help me and my company? Personalization of your brand: You may not have the same budget as coke, but that doesn’t mean you can’t use personalized branding strategy. You may not be able to brand each of your clients or employee names onto a shirt and give it to them because of how expensive this would be. But personalization isn’t just using someone’s name. It can be done on a different level by grouping customers and employees. Some different ways to group your clients or employees into categories are done by industry, common interests, lead sources, etc. It is really up to your creativity. By doing some simple analysis of your client base, or employees, you can break them up into these different groups. Then take these groups and personalize the promotional gear for those groups, whether you plan on selling the swag, using it as an incentive, or even using it to improve your brands impression, it will greatly improve the response you would receive from each group versus everyone getting the same promo item. By doing so you will greatly increase the effectiveness of each campaign. Your clients and employees will walk away feeling less like a number and will know that your company knows and thinks highly of them. For example, your clients are divided into 2 major industries, technology and medical. You could give them a shirt with your logo on it and be done, but if you were to design two different shirts that address the elements of both the technology and medical on the shirts, this will create greater impressions of your company in their eyes and will also show them that your brand understands their needs and industry. Get out of the box and think of ways that you can personalize your marketing. Give each group a different item; give the medical group branded scrubs and the tech group you give branded USB drives. Your brand is still in front of them and it holds more use and meaning to the two groups. 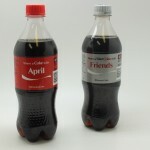 Cokes branding genius is a great reminder to all of us that we can do more to personalize our brand to our clients. With promotional marketing it doesn’t have to be 1 size fits all, we can personalize our brands even on a budget. This Coke campaign is great. Who wouldn’t pick up a bottle just because it has their name on it?